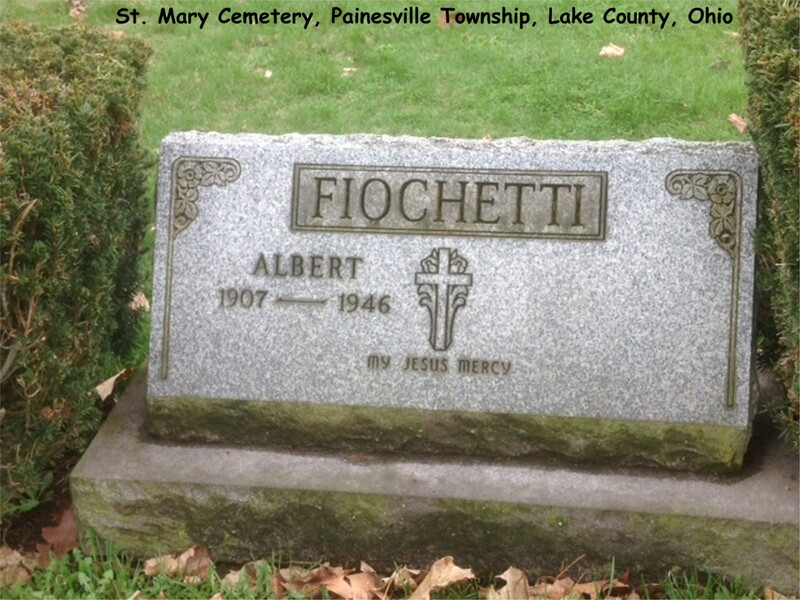 Alberto Fiocchetti first appears at Painesville Township, Lake County, Ohio, about 1944. 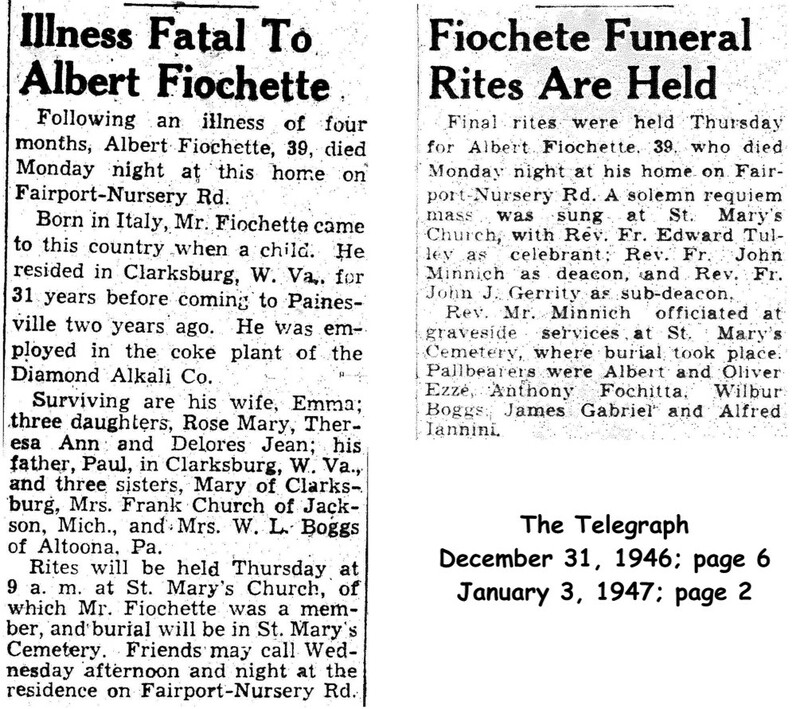 Mr. Fiochetti moved his wife and children from West Virginia to Painesville in 1944. In America, Alberto Fiocchetti was known Albert Fiochetti. Alberto Fiocchetti, son of Paolo Fiochetti and Rosa Panella, was born on Sunday, June 2, 1907, at Civita d’Antino, Italy. Alberto married Emilia Elena Izzi, daughter of Domenico and Rosa Izzi, on September 29, 1929, at Fairmont, West Virginia. Alberto died on December 30, 1946, at his home on Fairport-Nursery Road, Painesville Township, Lake County, Ohio, at age 39, of lymphosarcoma. His body was interred at Saint Mary Cemetery at Painesville Township, Lake County, Ohio. Alberto Fiocchetti immigrated to the United States about 1913. He was six years old. He lived in Clarksburg, West Virginia, for 31 years. Mr. Fiocchetti was enumerated for the 1940 Census of the United States living at Harrison County, West Virginia. Mr. Fiochetti, his wife and three daughters were living in the household of Alberto’s father, Paolo Fiochetti. 1. Rosemary J. Fiochetti was born on Thursday, February 11, 1932, at West Virginia. Rosemary married Rudolph J. Carlucci, son of Nicola Carlucci and Caroline M. Notte, on July 12, 1952, at Lake County, Ohio. 2. Teresa A. Fiochetti was born about 1936 at West Virginia. 3. Dolores Jean Fiochetti was born on Tuesday, November 14, 1939, at West Virginia. She married John C. Carlucci. Dolores Jean died on March 27, 1995, at age 55, at Hospice House, Cleveland, Cuyahoga County, Ohio, at age 55. Her body is interred at Riverside Cemetery, Painesville, Ohio.